Just south of Cincinnati, two exits off the Ohio River, in downtown Covington, KY sits an amazing ministry that is reaching out to its community with the Gospel. 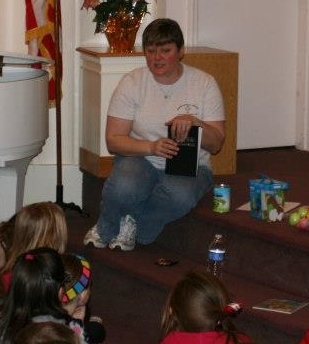 The Moore Activity Center (MAC), directed by North American Mission Board self-funded Missionary Amy Wilhelmus, opened its doors in 2004 as an outreach of Southside Baptist Church. Although they continue to work closely with the church, they are now a separate entity. Bible Study for children and youth. Since most have no other connection with church, this Bible Study is considered to be their “church time.” A meal is served, there is singing, prayer, a craft, gym time, and Bible focus. The MAC offers community fellowships from time to time for anyone, any age where they look for ways to bring people together just to interact with one another. These events have included such things as “Minute to Win It” games and a Hawaiian Luau. “Fun in the Son,” a Backyard Bible Club type event where they go out into the community and meet people on their own turf. A “24-Hour Day Camp” which is a one-day, overnight camp at a local church and done on a shoestring budget. The camp, for grades 1-6, focuses on helping kids to understand what God wants to do in their own lives. “Simply Dinner” meets every Tuesday in the summer as a time just to feed the kids. Local churches adopt a night to provide the meal and fellowship with the kids. “Big Give Aways” are held three times each year. Back-to-School – 150 to 200 children and youth in grades K-12 receive gym shoes, socks, school supplies, hygiene items, and haircuts. Thanksgiving – Includes worship, singing, and a meal to take home and prepare. Christmas – Includes worship, singing, a meal to take home to prepare, and toys & clothes for children 12 and under. Interesting in a mission trip to the Moore Activity Center? They would love to have teams come in and take a week of “Fun in the Son”, provide construction help, or assist with other outreach. Amy will work with your gifts and talents to use them to the fullest. Please pray about partnering with Amy and the MAC. Pray for financial needs, for volunteers to come and help meet needs & share Christ, and for them to be a source of light in their community. Also pray for a strong leader to come serve alongside Amy. If interested in learning more or in volunteering with this ministry contact Amy at 859-261-2300, [email protected], or on Facebook at Moore Activity Center (Covington, KY).